This 7.3 cu. ft. gas dryer has 9 drying programs, 7 options and 5 temperature levels and is equipped with the TrueSteam technology. Its Fabric Care Features include Sensor Dry and SteamFresh, a program that refreshes garments in a 20-minute cycle. The electronic control panel with the Dial-A-Cycle knob is paired with LED display for easy programming. Its 9 programs include basic settings such as Normal, Delicates, Ultra Delicates and Heavy Duty. Aside from the dryerís standard programs, there are also special options like EasyIron, SteamFresh and ReduceStatic. Drying time and temperature are regulated by the unitís Sensor Dry system. The Precise Temperature Control with Variable Heater releases just the right amount of heat depending on the dryerís setting. It prevents over-drying of clothes that may result to damage. The NeveRust Stainless Steel extra-large capacity drum is installed with a drying rack, where shoes, toys and other delicate clothes can be arranged to dry without tumbling. The circular door is made of transparent glass framed with chrome. It is reversible, which is useful for those who have tiny laundry rooms. The electronic control panel with LED display sits right above the door for easy access. The End of Cycle beeper will alert you when a cycle ends, while the Child Lock option will make your SteamDryer safer to use if you have little kids around the house. Its four leveling legs can be adjusted according to preference. The dryer is fully stackable, and can be placed on top of a matching washer unit. Optional pedestal and stacking kit are sold separately. The unitís top plate is porcelain, while the cabinet is made of steel. Available in two colors: Wild Cherry Red and White. The extra-large 7.3 cu. ft. capacity accommodates more clothes. Regulates drying time and temperature with the Sensor Dry system. 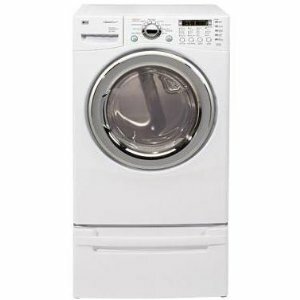 Like most gas dryers, the unit consumes less electricity than electric-heated dryers. It offers a wide array of programs and options. The LED display lets you monitor the status and remaining cycle time. The control panel is easy to operate. The dryer operates quietly with the LoDecibel technology. Static cling on clothes is reduced with the help of the ReduceStatic option. The dryer helps in decreasing wrinkles on clothes by using steam in drying. A light is installed inside the dryerís NeveRust Stainless Steel drum. Compact in size and has a reversible door. Parts and labor have 1 year warranty. The unit has a higher retail price compared with other dryers with the same features. Occasionally, the dryer takes up a lot of time drying clothes. The Normal setting usually doesnít dry garments properly.